What is the Difference Between Split Peas and Lentils? 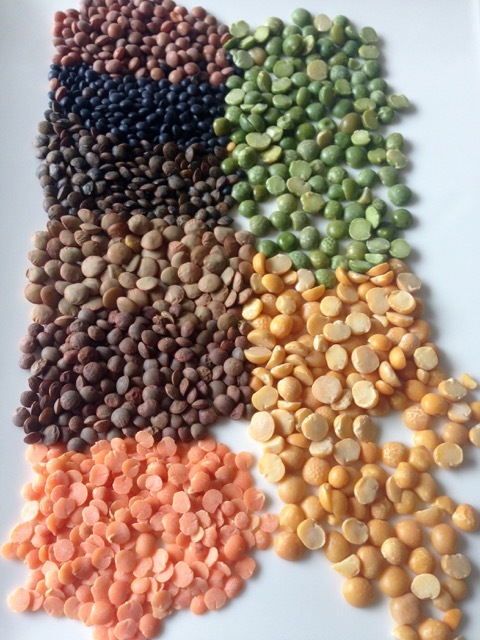 Lentils are on the left from top: Brown, Black Beluga, French Green, Laird Green (largest in size), Pardina (brown) and Red split lentil. 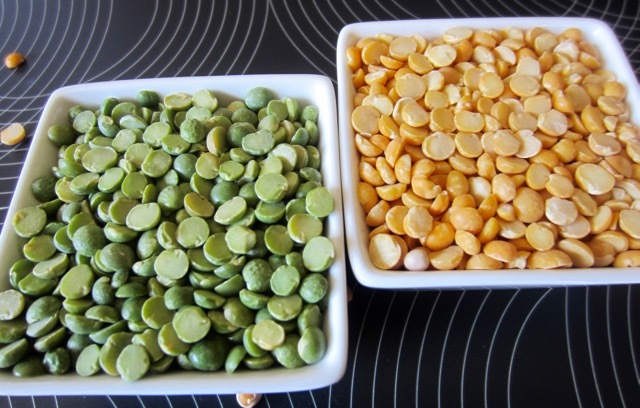 Split peas are on the right:split peas are always green or yellow in colour. All lentils belong to the species Lens culinaris. They usually have seeds that are shaped like a lens. The seeds can be flat or roundish in shape. Whole mature dried lentils vary in colour from green to brown to black and green mottled blue. Whole lentils are never red in colour. They only become red when they are husked and split. Whole lentils have more fibre than split lentils. Split lentils are yellow, orange or red depending on the variety. It’s mostly the split red lentils that are sold in Canada. 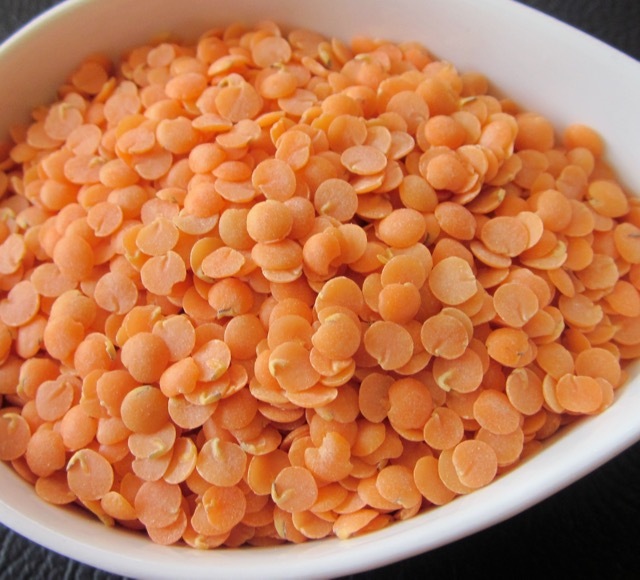 SIZE: In general lentils are smaller in size than split peas. The largest lentils are the green laird lentils which are 6-7 mm in diameter and can equal the size of the split peas. The rest are 4mm or less in size. Laird lentils were developed in Canada and are cultivated for specific markets. 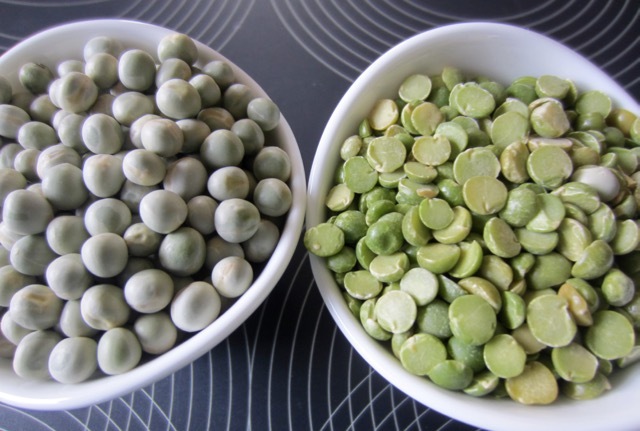 Split peas on the other hand belong to the species Pisum sativum, together with the fresh garden peas, Sno Pea and Sugar Snap Pea. Dried mature whole peas are green or yellow in colour. The whole green peas are dehulled and split to give the green spilt peas and the whole yellow peas are dehulled and split to give the yellow split Pea. 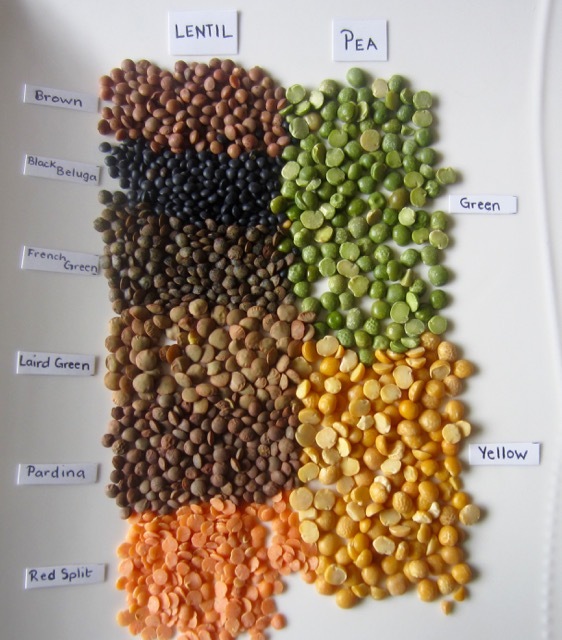 Split peas have less fibre because most of the fibre is found in the skin (seed coat). Both lentils and peas belong to the same family Leguminosae (Fabaceae) and are both legumes. They are both grown for their mature dried edible seeds, so they are both known as pulses. Both lentils and peas, can be sold whole, split or ground into flour. The colour of the whole lentil or whole pea is always different from the colour of the split lentil or pea and this can cause a lot of confusion if you are not familiar with the varieties available in the market. Both lentils and peas are high in protein (about 25/100g) and carbohydrates (about 60/100g) and are fat and cholesterol free. They are also rich in Iron and calcium. It’s interesting that we have many of the same lentil varieties by appearance, but the names are all different…another one of those things designed to confuse us cooks! I know. i studied botany for years so I find it easy but it may not be easy to the layman. It’s like me and computers, I’m not tech savvy at all. Thank you, Liz. I’m learning so much reading your posts at the moment.